My Family's Garage - a Memory of Hornsea. I have just come across your site and postcard of Newbigin Hornsea... 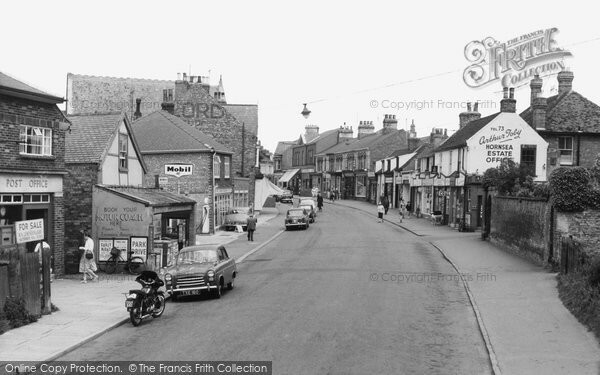 The garage pictured on the left was owned by my grandad, Arther Sherwood (who was married to Doris). My dad, Peter Edwin Sherwood (their son) and his wife Pat took over the business in the 60's, I believe. My dad sold the business to Mr Presscott, a local builder, in 1973-74. We then, myself (Annette Jane Sherwood) daughter of Peter and Pat Sherwood, moved to Bridlington in 1974. Whilst my parents where living in Hornsea my mum worked at the Doctors surgery on Eastgate for Dr Walker, who now owns the Hornsea Museum. Whilst there she worked with Olive Russell (my godmother), also working there was a Dr Callder. The other memories I can tell you are further down Newbigin where the local supermarket is now, there was a property called Tea Tree Cottage which was owned by Rose Carr, she had a livery service..she was one of my aunties. Whilst in the early days of the garage; Sherwoods ran buses which were later sold out to what is now East Yorksire Buses. My dad also drove taxis that belonged to Sherwoods of Hornsea. He told me that he drove one of the taxis that was fitted out in wedding ribbons for Sir Brian Rix. And also what from I remember, he did Sheila Merciers wedding (Sheila Merciers - Annie in Emmerdale Farm), as she is Sir Brian Rix's sister. I would love to here from you and any one who remembers my family. A memory shared by Jane Sherwood on Mar 14th, 2013. Send Jane Sherwood a message. Add a memory of Hornsea.